Reputation management for doctors continues to be more important with every passing year. A 2018 PatientPop survey revealed that 80.3 percent of providers are aware of the importance of a strong online reputation, but most of them don’t know how to alter their online reputation in a positive way. This is a massive problem. Without the right tools and methods at your disposal, you are not using online review sites to their full advantage, which means you lose out on better online exposure as well as patient retention and acquisition. Online reviews are quickly becoming an important factor in a patient’s healthcare decisions. A 2018 survey revealed that online reviews 66.3 percent of consumers when they were searching for a new primary care physician. That is the second-highest influence of online reviews across all industries. Patients are leaving reviews of their provider on multiple sites across the web, which makes it important to claim a listing on as many relevant review sites as possible. 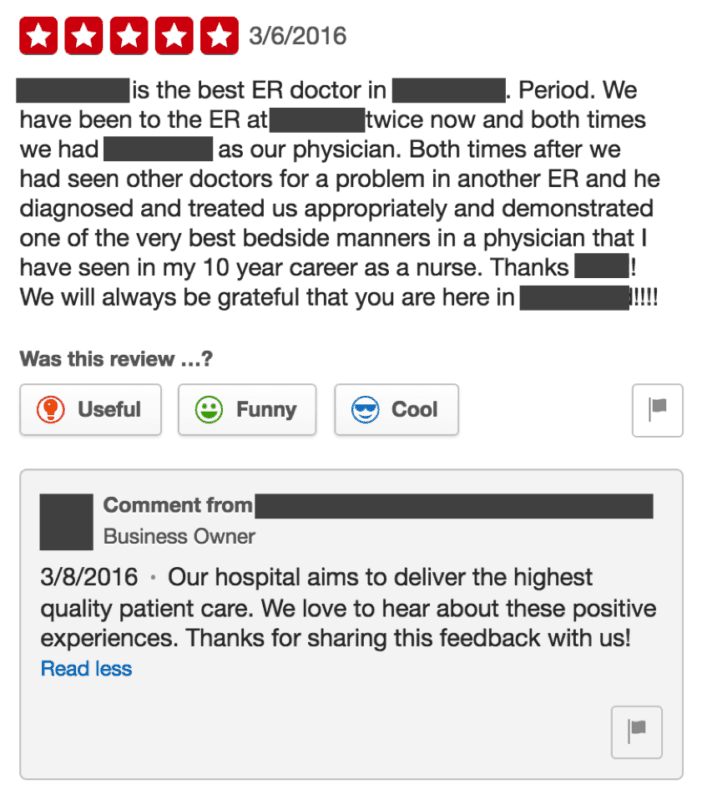 Doing so not only increases your reputation; it also helps with patient acquisition, especially if your current patients provide rave reviews. There are multiple sites that are obvious choices for a listing such as Google My Business and Yelp. You should also claim profiles on healthcare-specific reviews sites like Healthgrades, Vitals, and ZocDoc, which attract hundreds of thousands of viewers on a regular basis. Reviews are the backbone of any online listing. 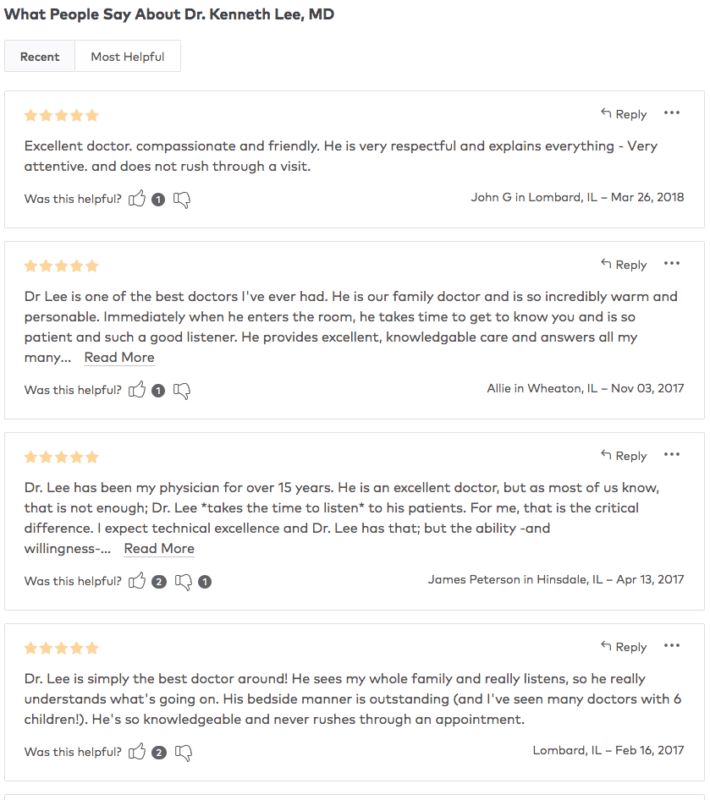 They serve as social proof that real people actually visited a physician and the ratings and text reviews accurately describe their experience. They’re also the first step in establishing a doctor’s trust and authority, which makes them paramount to their online reputation. It isn’t just enough to have a few reviews up on a listing; you’ll need to get more reviews in order to raise a doctor’s profile. Research shows that a majority of consumers (69 percent) see reviews older than three months as irrelevant to the current experience. What’s more interesting is that the PatientPop survey revealed that 71.3 percent of providers only receive reviews from at most five percent of their patient base. In other words, a small volume of reviews doesn’t bode well for a doctor’s online reputation, which makes review generation important for any medical practice. You can get more reviews by sending reminders to patients after their visit. This can be in the form of a short email, SMS message, or a small handout. There are even software solutions that allow you to automate review requests, which allow you to automatically ask patients for reviews after their visit. These requests should include a simple thank you message in addition to a request for them to leave a rating and/or a review on the review site of your choice. Before you send these requests, make sure that you are abiding by the review site’s guidelines when it comes to asking for reviews. For instance, Yelp frowns upon businesses asking customers to leave a review because it believes that any form of feedback should be unsolicited. Even with the reviews flowing in at a constant rate you should take some time to respond to both positive and negative feedback. Many practices have a fear of responding to feedback because it might put them in a bad light. In fact, the PatientPop survey showed that only 18.4 percent of providers have any sort of process in place to follow up with negative patient reviews. With a well-crafted response, you can address any issues that the patient while saving face with prospective patients. When responding, make sure that you first thank the reviewer for their feedback. This shows that you deeply care about their review. If it’s a positive review, reinforce some of the features or experiences featured in the review, but make sure that you follow HIPAA guidelines when responding. Even if a patient mentions their specific treatment in the review, don’t repeat it in your response. Make sure that you also share the feedback with staff members to show that their efforts actually make a sizable difference in the patient experience. If the review is negative you should still thank the reviewer for the feedback. You can then follow up with an apology for the issue and urge them to take the issue offline. Not only does this prevent further escalation in a public forum but it also prevents you from violating HIPAA guidelines, which come with substantial financial penalties. Patient experience encompasses everything from the initial appointment setup process to the time when the patient gets a follow-up call after the visit. Practices should do everything in their power to make sure that the patient experience is as smooth and stress-free as possible. Superb patient experience doesn’t just factor into a physician’s online reputation; it also helps with patient retention and higher revenue. The Advisory Board Company released a report showing that the average hospital sees an increased revenue of more than $22 million from a mere 10 percent increase in customer loyalty. You can easily find areas of improvement in the patient experience by getting valuable customer feedback. Reviews serve as one avenue of feedback, but you can also utilize surveys like HCAHPS or create your own set of questions to get valuable insight from patients. Patient engagement is an all-encompassing term for patient communication. Specifically, it’s a model that utilizes effective communication to create patients that are knowledgeable and accountable for their own health. Better engagement with easily accessible information. Patients don’t want to jump through too many hoops to look at their medical records or learn more about a diagnosis so make the process easier for them. Providers should also focus on adding some personalization to every interaction with a patient. This helps establish trust, but it tells the patient that the provider is highly invested in their well-being. In time, this will create a better provider/patient relationship, which leads to happier patients that want to write reviews. After all, there’s a higher likelihood that patients will leave a review after a positive experience. Changing course for a better online reputation with these tips won’t be easy and it won’t happen overnight, but it can change things for the better in the long run. With rave reviews, top-notch patient engagement, and excellent patient experiences any provider will see more revenue in addition to patient retention and acquisition.